"Listen, do you wanna go back, or do you wanna stay here? I get it. It's nice up here. You can just shut down all the systems, turn out all the lights, and just close your eyes and tune out everyone. There's nobody up here that can hurt you. It's safe. I mean, what's the point of going on? What's the point of living? Your kid died. Doesn't get any rougher than that. But still, it's a matter of what you do now. If you decide to go, then you gotta just get on with it. Sit back, enjoy the ride. You gotta plant both your feet on the ground and start livin' life. Hey, Ryan? It's time to go home." It's been two years since Gravity was released. I can still vividly remember how I felt sitting in my IMAX seat that day. I remember wondering if it would still hold its cinematic power at home on my television screen, a less immersive experience. It does. All of the same words that came to mind when I lost my Cuaron metaphorical space odyssey virginity still apply today. Dazzling. Thrilling. Brilliant. Beautiful. Inspiring. Emotionally devastating. Too much time has been spent analyzing the realism of the plight of Ryan Stone in space. Too much time questioning her odds of survival. I have spent too much time defending the film that I believe isn't merely the finest work from the year it was released, but one of the most profound achievements I have ever witnessed. "So, what do you like about being up here?" Just another disaster film? Style over substance? Why must this work of art be painted with such a vanilla brush? Style, sure, Gravity is a technical masterpiece of the highest order, the type of visually stunning, perfectly photographed and sublimely directed picture that deserves every damn award it won and then some. The substance though, that's what made those tears pour from my eyes. They still do. On a metaphorical level, these tense, beautifully paced 80 some odd minutes manage to simultaneously wreck me and yet build me back up stronger then ever by the mesmerizing and fiercely empowering final shot. The style may be the first thing people talk about when this movie gets mentioned, but the substance is why I find the experience to be unforgettable. "I know, we're all gonna die. Everybody knows that. But I'm going to die today. Funny that...you know, to know. But the thing is, is that I'm still scared. Really scared. Nobody will mourn for me, no one will pray for my soul. Will you mourn for me? Will you say a prayer for me? Or is it too late...ah, I mean I'd say one for myself but I've never prayed in my life. Nobody ever taught me how...nobody ever taught me how..."
As the father of a beautiful little girl, my best friend in this world, I don't understand how people do it. I can't comprehend how they go on. I wrap my arms around her at night and I never want to let go. When I am at work, I sit and wonder how her day is going. I always hope she is happy. I always hope she is smiling. I look at the clock and realize that in just a few minutes she will be walking out of the doors at her school and I wish I could be there to greet her. Every minute after I simply wish I could go home. I don't understand how people do it. I can't comprehend how they go on. 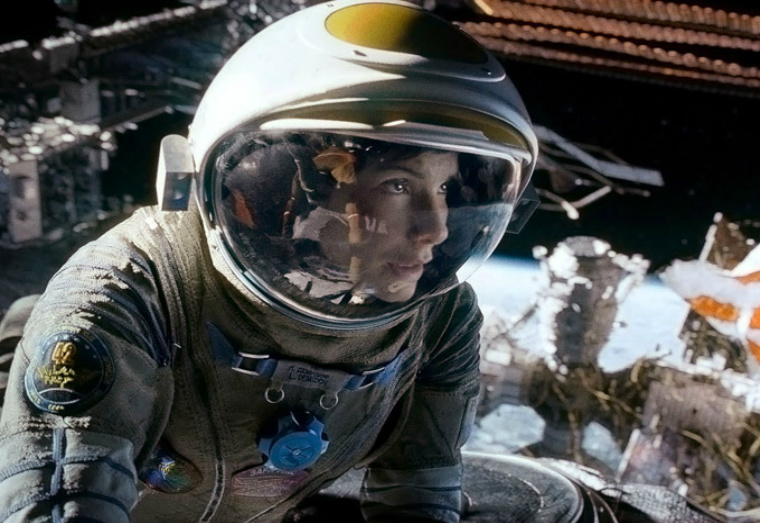 Despite it being the setting of the film, space is irrelevant in Gravity. The soul of this picture is not the space stations or the debris that destroys it. The beating heart of this movie is Ryan Stone and the crippling, devastating loss she suffered that fateful die when she was driving and got the call. Space is a brilliant place to be when you want to leave the world behind. It's dark, it's cold, it's vast and it is unforgiving. It will kill you in a moment's notice. It feels like death. The Earth that gorgeously glows throughout the film, filling the backdrop of so many frames like a silent character that effortlessly steals the show, it is bursting with life. If you let the grief consume you, define you, destroy you, leaving you unable to move forward, then the cold, dark silence feels comforting. If you want to find the strength to wake up each day and face a world that could be cruel enough to take everything from you, a world that at the best of times can feel Utopian and at the worst can feel like Hell, then you need to find a way back home. It's time to go home. Just when you think you fought hard enough to start over, it hits you. It hits you again and again and again, and it hurts. It feels impossible to keep going, to keep trying, to find a reason for hope and optimism when the weight on your shoulders feels hopeless. It's not impossible though. You can keep going. You can keep trying. You can keep fighting. Ryan Stone considers giving up as we all would. I know I would. She doesn't though. She keeps going. She keeps trying. She keeps fighting. 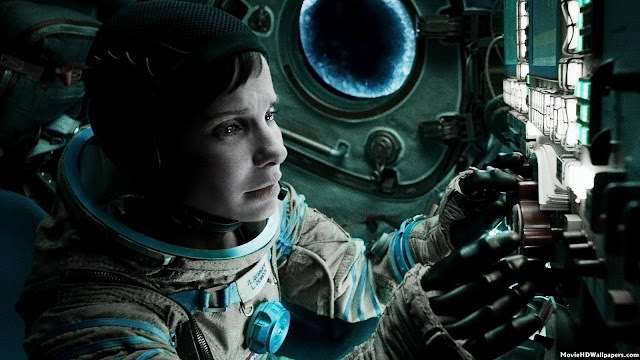 Sandra Bullock gives one of my favorite performances ever in a role that drained me of my tears yet filled me with so much inspiration and perspective on what truly matters in this world and what is just noise. What matters is that little girl that I can wrap my arms around and I should cherish every chance I get to do it because nothing is guaranteed. I hope she is happy. I hope she is smiling. The world is so much more beautiful with her in it. "Hey, Matt? Since I had to listen to endless hours of your storytelling this week, I need you to do me a favor. You're gonna see a little girl with brown hair. Very messy, lots of knots. She doesn't like to brush it. But that's okay. Her name is Sarah. Can you please tell her that mama found her red shoe? She was so worried about that shoe, Matt. But it was right under the bed. Give her a big hug and a big kiss from me and tell her that mama misses her. Tell her that she is my angel. And she makes me so proud. So, so proud. And you tell her that I'm not quitting. You tell her that I love her, Matt. You tell her that I love her so much. Can you do that for me?" Don't worry about the realism. Don't question the odds. Just imagine the thing you love most in this world being taken away from you and then root for Ryan Stone. Two years ago I drove home from the theater feeling forever changed by a single trip to the cinema. Absolutely nothing has changed. Gravity is one of my favorite films of all time. Great review for a great film that, unfortunately many deem "overrated" today. I'm one of the few who still holds in perfect regard, such as yourself, and I too will never forget seeing this in IMAX 3D. It was like nothing else I have ever experienced. That is great to hear Jordan and I really appreciate the kind words. When I watch this film (although experience might be a better word than watch), I find it baffling that some people have such ill thoughts about it. To each their own but this is the type of cinematic miracle that, basically, explains why I even write reviews in the first place. Because I find my passion inside movies like this. Ah interesting Cody. I actually find that to be even more exciting than someone like me who was counting down the days until this was released. I was already a fan of Cuaron prior to this one, from Y Tu Mama Tambien to his Harry Potter installment and the absolutely brilliant Children of Men, so the idea of him tackling a heavy, thematically rich space film had me feeling like a kid on Christmas the day it came out. For you though, to not be excited by it and yet still open up your mind and heart to it when you did see it, that is great. That it is such a special experience that you could drop any possibly negative bias and, as you said, have an unforgettable experience. That's outstanding.